This section gives a brief overview of various LDAP directory configurations, and how your Standalone LDAP Daemon slapd(8) fits in with the rest of the world. In this configuration, you run a slapd(8) instance which provides directory service for your local domain only. It does not interact with other directory servers in any way. This configuration is shown in Figure 3.1. Figure 3.1: Local service configuration. Use this configuration if you are just starting out (it's the one the quick-start guide makes for you) or if you want to provide a local service and are not interested in connecting to the rest of the world. It's easy to upgrade to another configuration later if you want. In this configuration, you run a slapd(8) instance which provides directory service for your local domain and configure it to return referrals to other servers capable of handling requests. You may run this service (or services) yourself or use one provided to you. This configuration is shown in Figure 3.2. Use this configuration if you want to provide local service and participate in the Global Directory, or you want to delegate responsibility for subordinate entries to another server. slapd(8) includes support for LDAP Sync-based replication, called syncrepl, which may be used to maintain shadow copies of directory information on multiple directory servers. In its most basic configuration, the master is a syncrepl provider and one or more slave (or shadow) are syncrepl consumers. An example master-slave configuration is shown in figure 3.3. This configuration can be used in conjunction with either of the first two configurations in situations where a single slapd(8) instance does not provide the required reliability or availability. 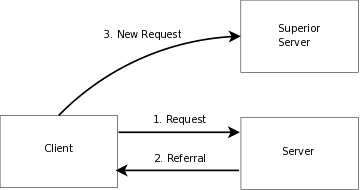 In this configuration, the local service is partitioned into smaller services, each of which may be replicated, and glued together with superior and subordinate referrals.